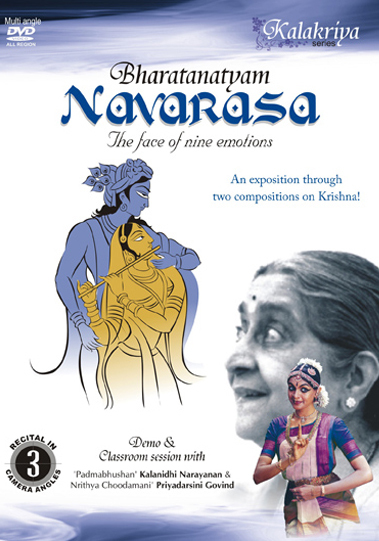 This product presents a vivid exposition of Navarasa, a component that forms the cornerstone of all streams if Indian classical dance and theatre. The nine basic emotions,as classified in ancient Bharatanatyam texts,spring forth with all their intensity and splendour through an exquisite and exhaustive classroom session involving 'Padmabhushan' Smt. Kalanidhi Narayanan, the legendary abhinaya exponent ('Maami' - to her students) and her illustrious disciple Priyadarsini Govind. It is an aesthetic voyage that takes the viewer through the labyrinths of Navarasa treating them to the beauty and complexity of the composotion and the character it portrays.Generously sharing her wisdom accumulated over the decades, 'Maami' provides useful tips for an effective portrayal of Navarasa. This composition presents little snapshots of Krishna describing his sweet talk, manly gait, intaxicuting caress and charming smile. Here a college of images unfolds,as a child Krishna enters the wrestling arena to take on the wrestlers set on him by Kamsa. What follows the classroom session is a sprightly demonstration of these compositions by Priyadarsini Govind. A great learning experience that all students of dance will cherish.